A magical place to come as part of a group safari tour. Take a tour of the local villages and learn about their way of life. There are extraordinary hot springs on lakeshore just a short journey away. Fishing can be organised by the lodge, enquire for details. Head out on a at Lake Manyara and view some of the local wildlife, keep an eye out for the famous tree-climbing lions! “Lake Manyara Tree Lodge is without doubt the most luxurious accommodation in Lake Manyara National Park. 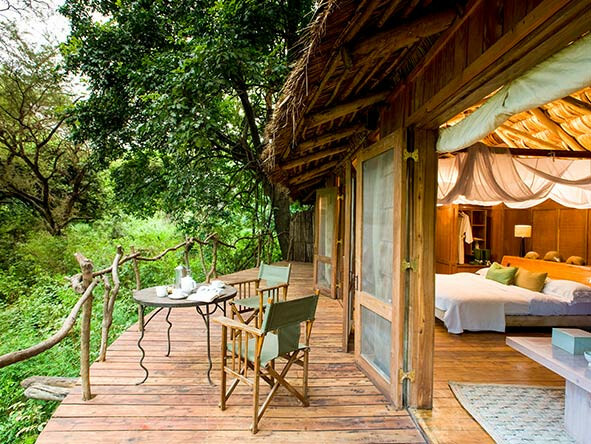 The camps luxurious safari tree house suites, crafted from local timber and makuti (palm fronds) are simply stunning. Lake Manyara Tree Lodge is discreetly tucked away in an ancient mahogany forest in close proximity to the exquisite soda lake of Lake Manyara itself. The camp consits of ten stilted tree house suites each with en-suite bathroom, outdoor shower and a private game viewing deck overlooking the forest.